Travelling with oxygen does not have to be a difficult experience. During the summer months, many of our patients hit the road by car and explore new places and revisit old ones. Using oxygen in your car is fairly simple if you are prepared and educated! Before taking off for some summer fun, the first thing to do should be to check with your physician. Let him or her know that you’re planning a trip and make sure that any restrictions on your activities are discussed. It's also wise to have copies of any prescriptions with you, including one for oxygen, just in case something comes up along the way. Things to discuss with your doctor should include: traveling at higher altitudes that normal, going to areas of high pollution, extreme temperature or humidity and seasonal allergies. A statement from your physician is vital if traveling by air. The most important rule of summertime travel with a POC is this: do not leave the unit in your automobile! Operating temperatures for these units go up to 104 degrees Fahrenheit; however, internal vehicle temperatures can easily exceed that at many popular vacation destinations, such as Las Vegas and Phoenix. If your POC is exposed to exceedingly high temperatures, it is important that the machine be brought back down to operating temperatures before being used. At Oxygen Concentrator Store, we offer many brands of portable oxygen concentrators (POCs) for your road trip. Our two most popular rentals include the SeQual Eclipse 5 and the Respironics SimplyGo. 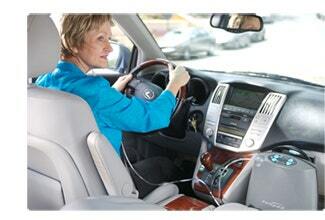 These units operate a little differently when plugged into the DC outlet in your vehicle. For example, the Eclipse will only go up to 2 LPM continuous flow, the battery will NOT charge when plugged into the DC, and the battery should be removed from the main unit while the unit is operating. The SimplyGo, on the other hand, will charge the batteries while running off the DC in your vehicle and removing the batteries is not necessary.